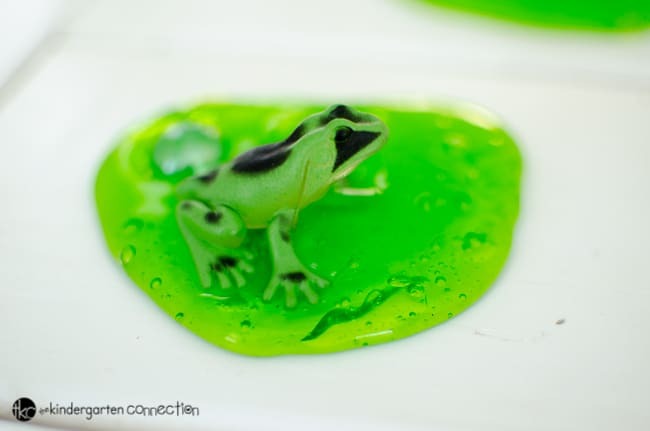 This lily pad frog slime recipe is a great way to make slime and have hands-on fun while learning about ponds or frogs. Use it for a frog theme and frog life cycles. In nature, lily pads are a floating leaf that comes from a water lily. Frogs typically hide on them to protect themselves from their predators – water snakes and certain fish. Not only does the lily pad provide safety, but it also produces shade which helps cool a pond. 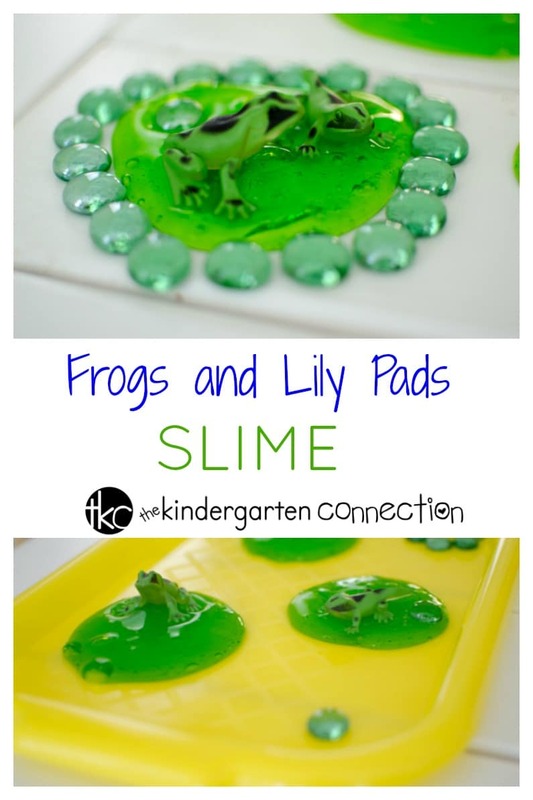 I thought lily pad slime would be a perfect slime project because the slime easily forms into a circle. And we love adding plastic toys to our slime projects. You could transform this into an entire pond life sensory play activity. Just be sure to keep vinegar handy for any slime that gets on clothes or hair. 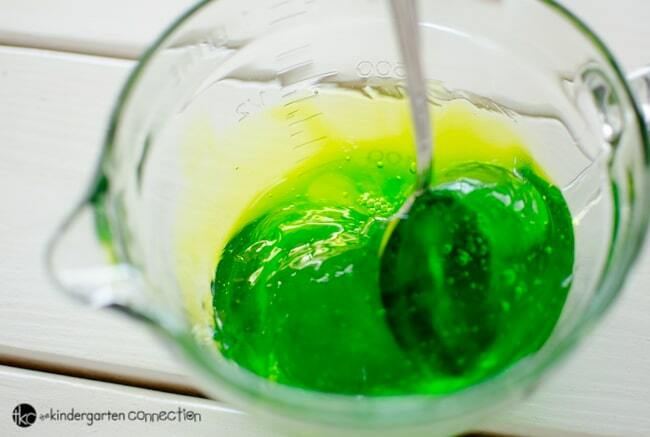 This recipe makes enough slime for about 2-4 children at a time. It takes about 15 minutes to make one batch. To get started, grab the following. I recommend using two bottles of glue because you want to get a perfect consistency of slime, and the second bottle is a backup. Make them one at a time though so that you can adapt the second one if necessary. Getting the perfect consistency the first time doesn’t always go so smoothly, so I like having the second bottle to make my slime completely perfect! 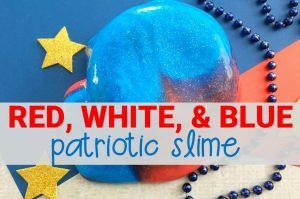 Clear or white glue work best for this slime. I only use Elmer’s and stick to their popular and common glues. Some of the specialized ones don’t work very well either. 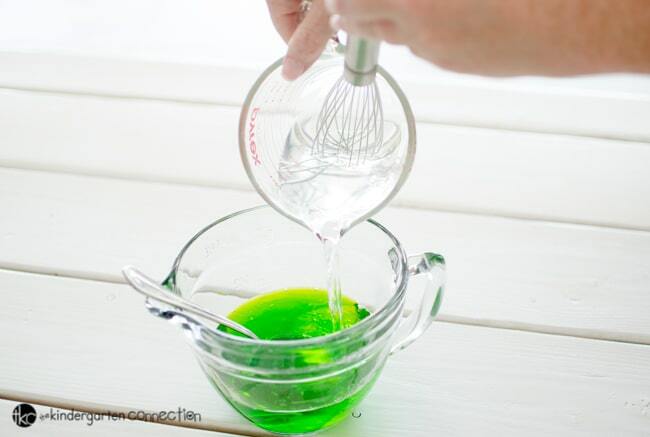 Add several drops of green liquid watercolor or food coloring. 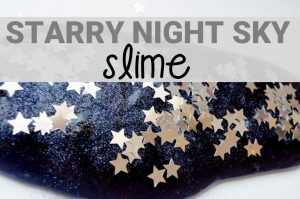 Take a small piece of slime and set in on a surface. You’ll see it spread into a circle after a minute or two, and it has magically transformed from just green slime to a lily pad. It’s all ready for the frogs to come start playing on it. 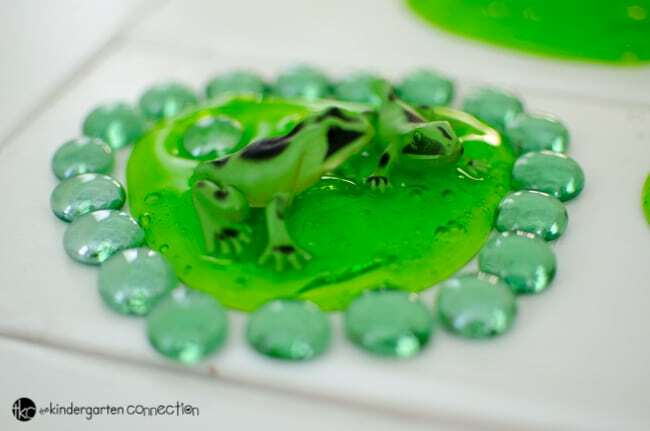 Feel free to add bugs, glass beads, and more to make this frog lily pad slime even more inviting!